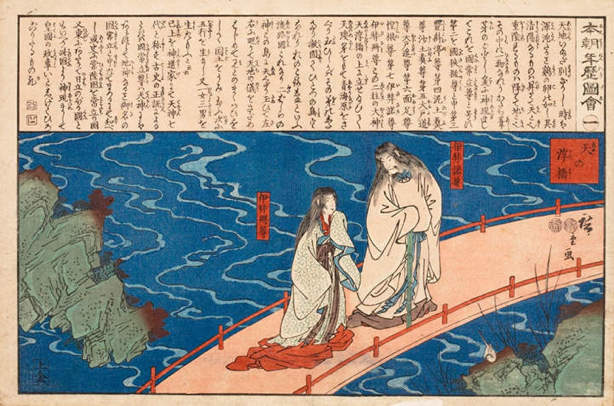 The “Floating Bridge of Heaven” (“Ame no Uki Hashi”) is an important part of the Japanese creation myth. According to the Kojiki (“A Record of Ancient Affairs”), the first gods summoned two divine beings into existence – the male essence Izanagi (“The Male who Invites” / 伊邪那岐) and the female essence Izanami (“The Female who Invites” / 伊邪那美命). These two beings were given the task of creating the first land masses on earth. Taking the jeweled spear they were given, the two divine beings stood on the Floating Bridge of Heaven and stirred the sea with the jeweled spear, creating a vortex. Drops of salty water falling from the spear formed the first island, whereupon the divine beings descended from the Bridge to the earth below. There’s a lot more (the Kojiki is a great tale, one of the world’s first soap operas), but for now let’s get back to how this relates to…Aikido. It is said that Aikido is “Standing on the Floating Bridge of Heaven”. This is one of those beautiful poetic phrases by the Founder that people tend to love – and then to forget a few minutes later, never having wondered whether O-Sensei was implicitly (or even explicitly) pointing towards some of the most important principles of his art (Aikido, maybe you’ve heard of it?). Is it important? Maybe not – understanding the principles behind whatever you’re doing, be it ballet or baseball, is not necessarily going to make you better at performing that activity. On the other hand, understanding the underlying principles can help you to work out what’s going wrong, and work towards what goes right. It also opens up entire new realms of possibilities. If you’re an Aikido student it seems a no brainer to me that you ought to be interested in what the Founder of the art had to say. More than that, I think that all Aikido students really have a responsibility to try to understand and to study those things as best they can. If you’re not an Aikido student – well, I study plenty of things written by non-Aikido folks who do interesting things that I’d like to know more about, and even if I don’t always get what they’re talking about at the very least it helps me to know what I don’t know. Believe me, if someone like Chen Xiaowang is standing around giving out information I’m going to at least take a look. In the Way, you must first stand on the Floating Bridge of Heaven. If you do not stand on the Floating Bridge of Heaven then Aiki will not come forth. That sounds pretty definite – no Floating Bridge, no Aiki. Another no brainer – no Aiki, no Aikido. Let’s see how this works with the Floating Bridge. The Floating Bridge of Heaven is the origin of the foundation for the Take Musu Aiki of Heaven. It is said that Aikido is “Standing on the Floating Bridge of Heaven”. The Floating Bridge of Heaven is the turning of fire and water bound together. Fire moves water, water is moved by fire. Fire and water are one thing. They turn in a spiral. They are entwined through Ki. That is something that is enacted through the breath (“iki”). 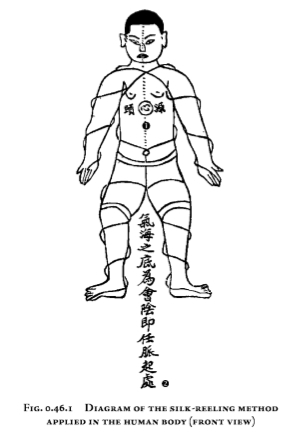 This breath (“iki”) is Aiki. Getting closer – “Fire” and “Water” represent opposing “In” and “Yo” forces. In “Aikido without peace or harmony” we saw the importance of opposing forces that are fit together or connected with Ki. 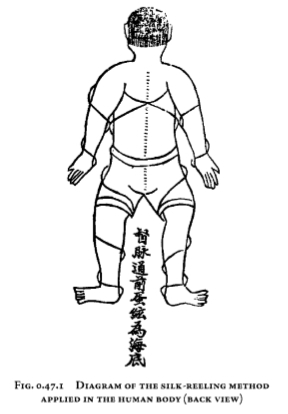 In fact, the Founder stated that “Take Musu” is the training of the “Inryoku” (“Attractive Force”) created when opposing forces are connected by Ki. Now we can see that the Floating Bridge of Heaven, since it is constructed of connected opposing forces, can indeed be said to be the foundation for “Take Musu Aiki”. Above the sound “A” and below the sound “O” – opposites connected with Ki, there Attractive Force (“Inryoku”) is created. Now we can take a closer look at the vowel sounds, and how Morihei Ueshiba used them as a mnemonic device. “The High Plain of Heaven” is itself another mnemonic, we’ll examine that another time. “Earth”, literally “Onokoro Island”, the original island of Japan, formed by the gods who stood on the floating bridge. And there you have it – a pretty neat description of the Floating Bridge itself. Coincidentally (or maybe not), it’s also a good description of the Chinese training methodology embodied in Heaven-Earth-Man that we discussed in “Aikido without peace or harmony“. Comparing the two, you can see that the Floating Bridge and Heaven-Earth-Man are, in fact, discussing the same training methodology. The above sequence of vowels describes the concept of the physical methodology of the Floating Bridge (a.k.a. “Heaven-Earth-Man”). These vowels were often rearranged by Morihei Ueshiba to represent different concepts. For example, the vowels were sometimes reordered to express the progression of spiritual training and development. I may go into that more at a future date, I mention it now to avoid confusion. I studied Aikido from Morihei Ueshiba, here again doing everything first and questioning later. Ueshiba Sensei was a master of Ki, as well as the founder of Aikido. 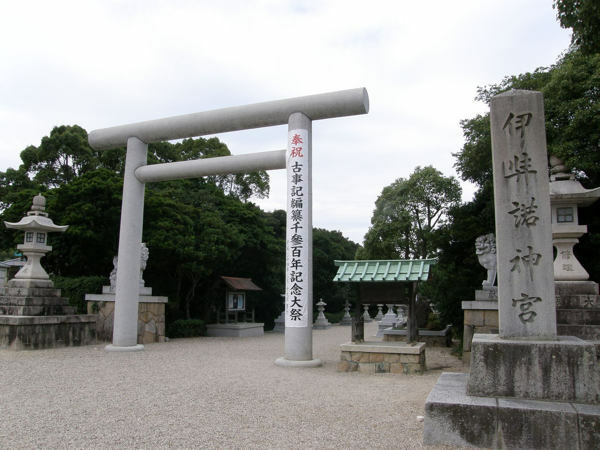 However he was also a devoted follower of the Omotokyo Religion, and this influenced the way he taught Aikido. Often it was impossible to make any sense of his esoteric explanations. I rigorously trained in all of the exercises he had us do, though many came from the Omotokyo Religion, and made no sense to us. For example, we were expected to recite the alphabet in a different order. Rather than saying the vowels of Japanese as ”AIUEO” we were made to repeat them over and over as ”AOUEI,” as if this new sequence had a deeper meaning. Moving along, we see that these opposing forces, joined by Ki, feed into each other in continuous spirals. We also see Ueshiba bring up “iki”, which is also very important, but which we will discuss at a future date. For now, remember these spirals from “Morihei Ueshiba, Budo and Kamae“? Above, the same process that Morihei Ueshiba talked about with the Floating Bridge is described in Chen Taiji, the positive and negative (flow and counter-flow of shun and ni) spirals winding through the body. The left hand is Izanagi, the right is Izanami, in the center is Ame-no-minakanushi, this is yourself. This is standing on the Floating Bridge of Heaven and turning in a spiral. This is called Taka-ama-hara. Heaven and earth are one unit, water and fire are also one unit, all appears through Iki (breath). This is the endless appearance of the Kami. Aiki technique comes forth endlessly. 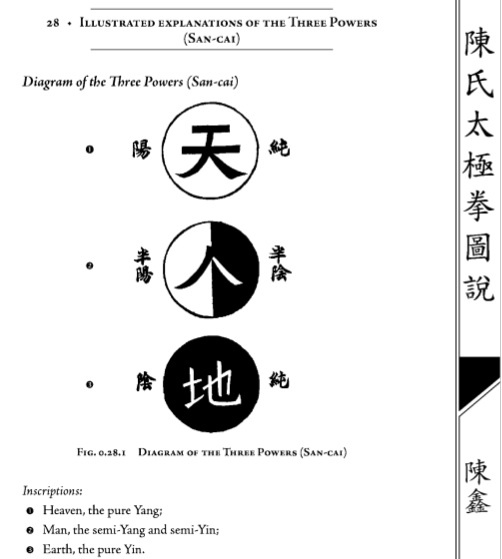 Manifest yo (yang) in the right hand, change the left hand to in (yin) and guide the opponent. Ame-no-minakanushi was the first deity to appear in heaven – in other words, the “Boss” who stands in the center. Ueshiba says that you yourself are the “Boss” – as in 我即宇宙・宇宙即我 ” I am the Universe, the Universe is me.”. This is a very simple, but very important and powerful point. It is also another of those beautiful poetic phrases by the Founder that people tend to love – without considering that it may also be one of the most important technical instructions that he ever gave. The “Boss” stands on the Floating Bridge uniting the opposing In-Yo forces and moves in a spiral. Interestingly, the movement of the two gods Izanagi and Izanami as they mated is often represented as a spiral – additionally, when Izanagi stirred the seas with the jeweled spear to create the first land a vortex (spiral) was created. This state, says the Founder, standing on the Floating Bridge uniting the opposing In-Yo forces and moving in a spiral, is Taka-ama-hara – Heaven, so to speak. As noted in “Aikido and the Structure of the Universe“, this is a state that, according to the Founder, exists within yourself – in other words, Aiki is a state created within your own body and mind. This is very different from a situation in which Aiki is defined by matching yourself to some external condition, such as your partner or opponent. Again, this reinforces the point made earlier – you yourself are the “Boss”. So to sum up – the Floating Bridge of Heaven, also known as Heaven-Earth-Man, consists of creating a state within yourself by which you connect opposing forces and express that connection in spirals through the body. Aiki is Love, isn’t it? Aiki isn’t Love, is it? Thanks Urs, glad you enjoyed it! I keep reading your articles, so one day I figure out what Aikido is about. Anyway, I have noticed already that my understanding and my practice has changed because of your writtings associated with what I have learnt from my Sensei. Thanks Doug, I’m happy that this is all helping you in your training! My question is wheter it is a state within yourself or is it the forming of a yourself? Are you the boss, or is it that your intend, that what should be practiced, what is forming the you. Is the you not the result of the spriraling yin and yang? Is this not what is meant when one speaks of ‘ a appropiate response’? Is it not the itend that is forming the world? And your you therefore not the universe? Matsagatsu agatsu gatsuha ha ia bi? Some simple questions. As a contribution to a very interessting blog. This is imo very inline with everything I learned over the last 30 years. Amazing, many bits and parts fell into one piece after reading this. Thanks you Chris. Very supplementary to this : the Secret of the Golden Flower, Jacobs Ladder, the list is expanding. Thanks Leo, glad that you enjoyed it! Chris, in the San Cai (Heaven, Man, Earth), the idea is more that the Ki of Man is augmented by the Ki of Earth (Gravity) and the Ki of Heaven (Oxygen, pressure, etc.). I.e., there are no forces or Ki within Man that don’t rely on the input from Heaven and Earth. If, as an example, I push someone, using the ki skills that I have, I still have to derive support from the ground/earth/gravity or I’d just be floating in space unable to deliver any power. So if I use my ki to push someone, my ki is actually partially the ki of the earth. If I add the pressure skills to my push, then my push would be the composite of the Ki of Earth, the Ki of Man, and the Ki of Heaven. If I was twisted and off-balance when I tried to push you, they’d say “no Ki” because without the input (solidity) from the ground, a necessary component of my ki would be missing, so my ki without input from the ground would be empty. Thanks for the thoughts Mike! fantastic stuff on this site. really helping me to clearly define my aikido journey. thank you for your thorough research and articulate writing. I’m happy that you’re finding it useful! the author of Illustratted explanations of chen family taijiquan is Chen Xin (pinsan) the original name is chenshi taijiquan tushou.